Review of Martin E. Marty, Dietrich Bonhoeffer’s Letters and Papers from Prison. 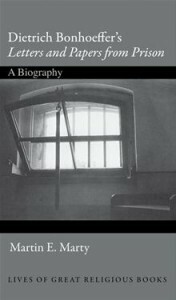 A biography (Princeton University Press, 2011), 275 Pp., ISBN 978-0-691-13921-0. Princeton University Press is to be commended for launching a new series of biographies, not of well-known authors, but of their well-known books, and also for including Dietrich Bonhoeffer’s Letters and Papers from Prison (LPP) in the first group to appear. Equally welcome is the choice as biographer of the eminent Chicago scholar Martin Marty, who has done so much to popularize religious thought in his numerous writings. Essentially Marty gives us a well-informed survey of LPP’s reception over the past sixty-five years. He begins by describing the exceptional, almost adventitious circumstances of how the book was born. Bonhoeffer was arrested in April 1943 and placed in solitary confinement in a dank and fetid-smelling cell in Tegel Prison in Berlin. For months he suffered from being cut off from his former intellectual and pastoral activities, and from his family and fiancée. But later, thanks to a friendly prison guard, he was able to smuggle out letters, especially to his closest associate Eberhard Bethge. And then, in the period from April to August 1944, he embarked on a voyage of theological exploration, with radically challenging ideas about the future of Christian witness and the role of the church. The texts of these fragmentary letters were to form the bulk of the book at its first appearance. Although his ideas were not fully developed, it is clear that Bonhoeffer hoped they would be the basis for a future book. He therefore asked for them to be securely preserved. Bethge was then serving with the German army in Italy. But he sent the letters back to his wife in Berlin with instructions to bury them in the garden, safe from the Gestapo or air-raids. Miraculously they survived. Months later they were disinterred, and the task of deciphering Bonhoeffer’s terrible handwriting began. Thanks to Bethge’s determination, the first selection came to be published in 1951. As Marty rightly comments, “had Bethge not done his storing and editing work, the only Bonhoeffer the larger world would know was the promising theologian whose career had been cut short by the war” (39). Bethge knew that publishing LPP was a risky business. The majority of the German Protestant clergy regarded Bonhoeffer’s participation in the plot to assassinate Hitler as a criminal dereliction of both his national and professional loyalties. Protestant clergymen could neither condone nor connive at murder, especially of the head of state. Hence the refusal by the Bishop of Munich, Hans Meiser, in early 1953 to attend a commemorative service at Flossenburg concentration camp because he saw Bonhoeffer as a political not a Christian martyr. It took many years before the climate of opinion in West Germany changed towards those who had taken part in the anti-Nazi resistance movement, and only grudgingly was this act of political witness accorded fitting recognition. By contrast, in church circles abroad, particularly amongst supporters of the ecumenical movement such as Bishop George Bell of Chichester, Bonhoeffer’s sacrifice of his life in such a cause was early on acknowledged and acclaimed. LPP provided the evidence such supporters needed. On the other hand, the question still remains an open one whether or not the reputation of LPP was enhanced by the fact that its author died a martyr’s death. The first translation of LPP into English was published as a slim paperback by S.C.M. Press in 1953. It received immediate praise in Britain and subsequently in North America. It came at a time when many church members were questioning their traditional orthodoxies and pietistic practices. So Bonhoeffer’s controversial and provocative ideas about “a world come of age” and the need for a “religion-less Christianity” sparked great debate. His portrayal of Jesus as “the man for others” was enormously attractive to many, but to others an exaggerated and paradoxical distortion of Christian doctrine. In the English-speaking world, the ideas expressed in LPP gained even more notice and/or notoriety through their very wide popularization in Bishop John Robinson of Woolwich’s short book, Honest to God, which appeared in 1963. Robinson sought to show that LPP brought a message promising freedom and authenticity to a Christianity liberated from its subservience to the state and ecclesiastical tradition. Robinson’s advocacy was dynamite for a questioning church and an unstable academic community. Those seekers and devotionalists who had eagerly latched on to The Cost of Discipleship, and found inspiration and spiritual sustenance, were now jolted into a new dimension. In a world come of age, Christians were called to a much more radical obedience, both politically and socially. They were summoned to abandon the individualistic, ego-centric pursuit of personal holiness but rather to share in the sufferings of God in the world. Robinson sought to enlist the ideas of LPP to shake up the comfortable English church establishment. But in the United States, Bonhoeffer’s radicalism was extended much further. The American theologian William Hamilton took up the non-religious interpretation of Christianity, the coming of age of the world and the need to live etsi deus non daretur, and formulated his theology for the death of God. Where Robinson sought to reform, Hamilton sought to abolish. For him Bonhoeffer was significant because he had rightly focussed on the accelerating pace of secularization, the increasing unimportance and powerlessness of religion, and the end of special privilege for religious men and religious institutions. Such iconoclasm in pursuit of Christian atheism evoked strong responses. Hamilton was accused of distorting LPP for his own ends. But, as Marty rightly comments, Bonhoeffer did write some provocative and exploratory pages and did not live long enough to clarify and develop his concepts. In the meanwhile, and in another quarter, Bonhoeffer’s writings were being exploited for quite different purposes. In East Berlin, in what was then the Communist-controlled German Democratic Republic, the theologians of the Humboldt University sought to use Bonhoeffer’s challenging radicalism as part of their campaign for the creation of a new Marxist-based social order. Hanfried Mueller, for example, took up Bonhoeffer’s idea of the world come of age to propagate his view that LPP envisaged a religion-less and class-less society. His advocacy for a kind of Christian utopian Marxism was aimed to build up support amongst the East German Protestant clergy for the new socialist regime in the G.D.R. Despite its brilliance, Mueller’s book found little credence. For most western critics, he distorted LPP for obvious political ends. And the whole attempt, of course, collapsed in 1989. Such creative misuses of LPP were not destined to last. More recently, Marty notes, there has been an increasing interest in LPP among Catholic theologians, who find there an inspiring record of religious fidelity. Especially since the Second Vatican Council, many Catholics have found common fears and hopes expressed in LPP. In the drastically changed context of theology and faith, the old walls of separation have broken down, drawing both Catholics and Protestants to seek for a new ecumenically promoted agenda. Most notable in Marty’s view is the increasing interest in Bonhoeffer among Evangelicals. Most of them, such as his recent biographer Eric Metaxas, had long favoured his earlier writings and had avoided or downplayed the radical questions posed in LPP. But here too, Marty believes, many Evangelicals are on the move from frozen positions or stereotypes. Others were attracted by the family values and social order implied in LPP. Marty’s penultimate chapter covers the reception given to LPP in the wider world. “Who is Jesus Christ for us today?” is as captivating a question in Cape Town as it is in Korea. Even while Bonhoeffer’s reputation was still a chequered or at least an ambiguous one in his homeland, Germany, he was much more readily hailed as a prophet abroad. In South Africa, for example, the story of resistance against tyranny echoed loudly in the struggle against apartheid. LPP showed the biblical basis for identifying with the suffering and oppressed in any situation. So too in Latin America, the ideas of LPP could come to be seen as the “cusp of liberation theology” (199). But, in the course of time, there were also those liberationists and feminists who pounced on passages in LPP which they believed displayed Bonhoeffer’s paternalistic, elitist or even sexist opinions. Yet Marty is surely right to point out the dangers of anachronistic distortion. Some commentators have undoubtedly used the messages of LPP to further their own ends or to exploit Bonhoeffer’s ideology for their own purposes. “Are we still of any use?” Marty’s final chapter discusses continuity and change in Bonhoeffer’s ideas. Many commentators, he notes, have seen a striking change between his early writings and his later prison letters. Some even, like Edwin Robertson, regard the latter as dangerous for believers, both doctrinally and morally. But Marty emphasises the continuity, especially in Bonhoeffer’s Christology. This, he claims is the connecting thread which links but also goes beyond the numerous paradoxes contained in LPP. At the same time, he asserts that it is these same intriguing reflections which have already guaranteed LPP a long life-cycle, and will undoubtedly continue to inspire and challenge both Christian and secular enquirers in the years ahead.